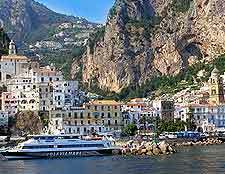 A popular coastal resort brimming with related attractions, Amalfi attracts crowds of tourists during the summer season, when visitors flock here each year to soak up the sun on the soft beaches, bathe in the sea and generally relax in the fine weather. 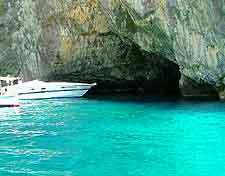 One of the most famous and most visited tourist attractions along the coastline, the Grotto dello Smeraldo is situated around 4 km / 2.5 miles along the Amalfi Coast and is close to Positano. 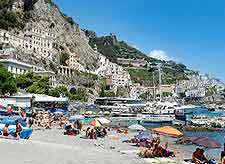 Other attractions around Amalfi include boat trips, water sports, outdoor cafes around the Piazza del Duomo, and the adjoining town of Atrani. Famous throughout Campania, the Amalfi Coast is one of the region's biggest attractions and the sandy Mediterranean beaches are nothing short of glorious. The Spiaggia Fornillo is amongst the region's most popular beaches and is just a short distance from the town centre, featuring many good facilities situated conveniently close by. Those looking to try their hand at scuba diving or snorkelling should head to the nearby Villagio Nettuno. Whilst many tourists are quite content to lay back on the sands and enjoy the views, others choose to take boat trips along the Amalfi Coast, to neighbouring destinations such as Ravello, Sorrento and the islands of Ischia and Capri. Regular ferries and hydrofoils also head to the Bay of Naples and tend to be both speedy and reasonably priced, particularly if you use the summer service offered by 'Metro del Mare'. Tickets can be purchased from a kiosk close to the marina, where a current timetable of most services is displayed. Expect some awesome views along the way. The Grotto dello Smeraldo is a spectacular sea cavern located in the Conca dei Marini and is known as the 'Emerald Grotto', getting its name from the rich green colour of its pretty sandy floor. Reached by either boat or bus, the Grotto dello Smeraldo is one sight not to miss and inside you will discover some huge stalagmites and stalactites. The admission charge includes a guided tour and barge ride. Those arriving by bus will be able to access the Emerald Grotto by either a steep stairway or lift. The Piazza del Duomo marks the very heart of the town and is central to the action. Many attractions are littered around the piazza, including Almafi's very own cathedral (Duomo). During the summer season, this historic square is bustling with people and edged with cafes, whose tables spill out onto the paving so that diners can enjoy the sunshine. This is a good place to meet up, or simply sit back, relax and people watch. 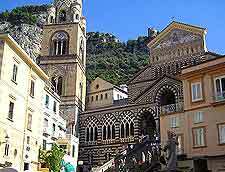 Most people consider the adjacent town of Atrani to be a suburb of Amalfi, since it is so close. 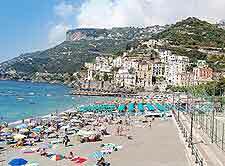 The attractions of Atrani are literally just a short walk away and can be reached in a matter of minutes, by passing the port and heading out along the main road. 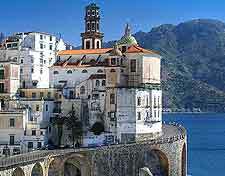 Atrani offers a traditional character, small beach area and a central piazza, which is surrounded by a number of shops and restaurants. This is a good place to escape from summer tourists, since it is mainly only locals who frequent this town.